Some weddings really stand out in my mind, and this was one of them. After corresponding with this Hants, UK couple by the time I met them I felt like I knew them. Visiting for two weeks and staying at Morritts, this couple wanted MSC for their wedding spot, and they were not disappointed. From the very beginning they said they wanted a white stretch limousine for the 1 hour journey from Morritts to George Town. I liked the choice of touch of violets for the bride's hair, which were reflected in her bouquet with cream roses, and the groom's boutonniere. Posing with Joy for the traditional proof shot. These are my friends Judith and Bill who I invited along to act as witnesses, and also because they had never seen one of my weddings. Bill was quite a famous footballer, playing for Middlesborough. Funnily enough, another even more famous footballer, Jack Charlton was in town this weekend, and I am hoping our newly weds got to meet him and his wife, Pat. This couple got some excellent candid shots like this one. We all enjoyed a couple of bottles of my famous Simply Weddings bubbly, which is very good, we all decided. 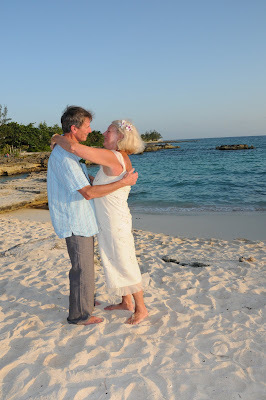 The end of a perfect wedding day in the Cayman Islands. been talking about it ever since. back to Morritts smooth and quiet. our way to the airport to say goodbye!! Ceremony by Joy for Simply Weddings, flowers by Trisha's Roses, photography by Dubadah Boldeau, limo by Grand Limousines.